Made it through Bazaart! Thanks to everyone who stopped by my booth! I had a great time this weekend and made lots of sales! Now onto Holiday HEap! I think this is one of my most favorite shows to be in! The audience is wonderful! All smiles and happy-go-lucky shoppers! How could you beat that for a day! I'm busy stocking uo my iron on patches and narrative pillows for this week. Will try to post picts this week ! 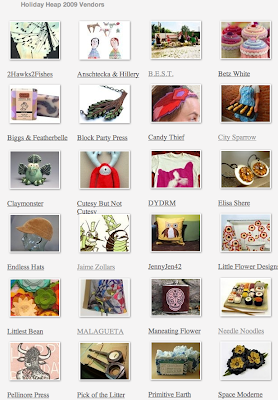 In the meantime, lok though the vendor list and mark your favorites on your shopping list!